Complex but fresh on the nose with tropical fruits, star fruit and peaches. Sweet notes of vanilla are coming through, nicely mixed with butterscotch, milk chocolate biscuits and a touch of mint. Wow - this one is very bold and intense on the palate. Rather peppery along with a discreet sweetness of vanilla, biscuits and icing sugar. Very warming indeed. Once the warmth and spiciness fade sweet notes of honey and golden syrup linger with some fresh mint towards the finish. Pleasantly mouthfilling. A long and warm finish with creamy sweetness, honey, notes of bananas, along with milk chocolate and a lingering nuttiness. The fruitiness on the nose is a bit tamed when a few drops of water are added. Still sweet with vanilla. On the palate the spiciness is pushed in the background with fruity notes of peaches, star fruit and bananas coming through. The finish is significantly shorter with only a touch of sweet vanilla, and dry oak on the tail. This Tullibardine is old in a sense that it shows multi-layered notes of fruits, nicely mixed with vanilla, biscuits and a significant amount of spiciness resulting from 25 years of maturation in a wooden hogshead. On the other hand, however, this dram is still fresh - especially on the nose - with a delicate note of mint. 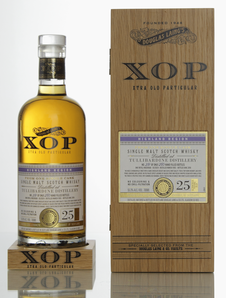 A complex single malt which needs time to develop its full aroma profile. But its worth every minute!